^Are you sure SE's file is in there? Because it's called tg_gasgiant_col.glsl in his post, but there's only tg_clouds_color.glsl and height in the folder. This http://spaceengine.org/_fr/2/new-clouds-shad.zip is correct link for SpaceEngineer's files. That third one is like, neon or something, lol. Although maybe it's around a red colored star. The cloud ones are the same as the cloud shader mod, right? Just checking, although there might be a newer version over there. Also, Maybe merge the gas giant shader and cloud shader mod threads together, if you guys are going to put them into one mod. Miros, if NEMESIS already posted his problem on the Russian forum, and his problem was with SpaceEngineer's files, then that means that SpaceEngineer will already see his post. There is no need to post it here as well. Is it me or do the orange and blue striped gas giants seem a bit common? The stripes themselves are not blue, it is the lack of high-altitude clouds at that latitude that allows for Rayleigh scattering of light to produce the blue color on an Earth or Neptune type atmosphere model. 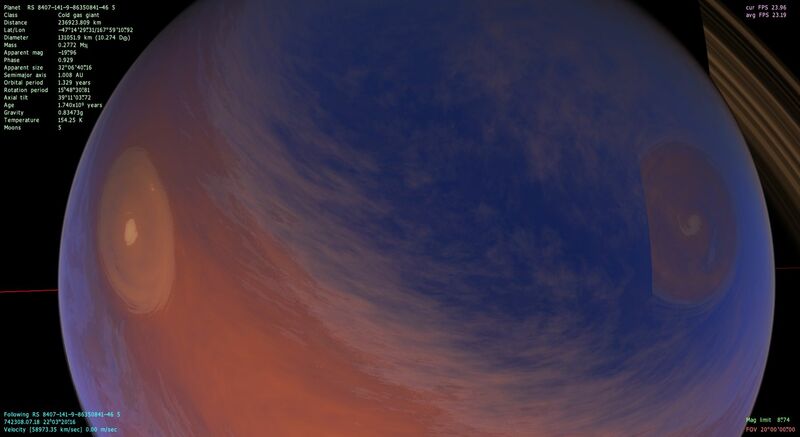 Similar to how parts of Saturn look blue at different times of the year. Orange is a common color for the clouds themselves to be generated with. So orange and blue will be fairly common for this reason. 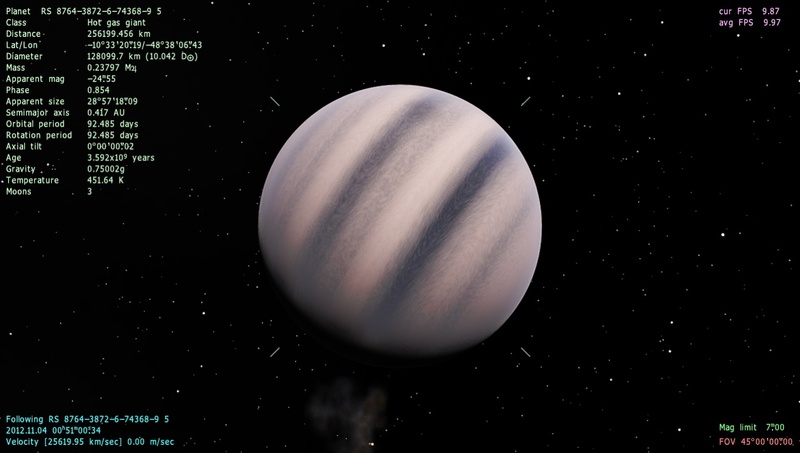 Hrm, theres still a few greyscale gas giants, but they're rare. I've left the planet info (and code) in the screenshot in case you or Space Engineer wants to look deeper and see what the cause is. I think it may be a function of the atmosphere since all the greyscale ones have a white atmosphere. Weird I put in that location and I was given a desert planet. 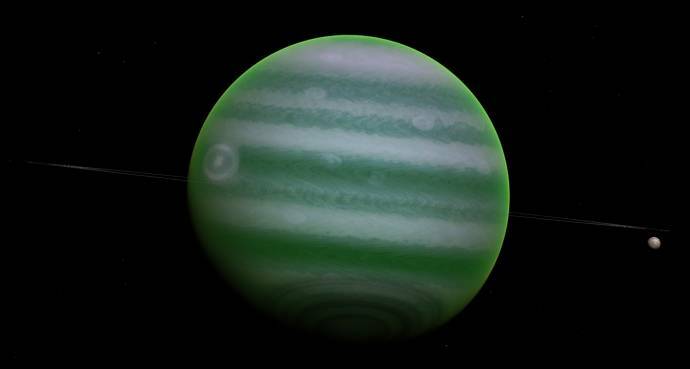 However same system has a gas giant that looks like that one. This is normal really. All those messed up lines from my editing were removed/fixed. Swap in the original shaders though and see what happens I guess. DoctorOfSpace SpaceEngineer Will be the next release more new Gas Giants and with Spots ? What do you mean "with spots"
The spots are still there, it just depends on what gas giant. The cloud ones are the same as the cloud shader mod, right? Yes, this file Spaceengineer post on russian forum. I'm sad because i can't test these right now.